The Sant Martí district is bordered to the east by the old town and the Eixample. This former industrial area is now a district with many new homes, shopping centres and malls, as well as plentiful restaurants, bars and pubs. The metro line L4 travels about 500 metres from the coast. You can also explore Sant Martí with the double-decker buses, which also travel along the coast. Here life is lived near the seaside. Along the Vila Olimpica beach, from the Olympic marina to the eastern part of the Poblenou district, there is a lot going on in the evening. In the eastern part of the Diagonal Mar i el Front Marítim district you can find the Fòrum, where major concerts and festivals often take place. Culinary is mainly Mediterranean cuisine, which offers a wide range of fish and seafood at home. 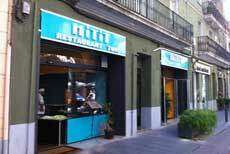 However, international restaurants can be found in the district of Sant Martí. As Sant Martí is mainly a residential area - apart from the areas near the beach - here the concentration of restaurants is not as high as in the old town. 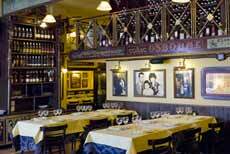 The history of this restaurant takes us back in time to the district of Barceloneta, the old district of the fishermen. 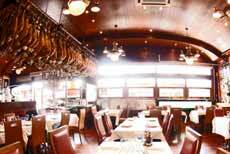 The restaurant was founded there in 1971; no wonder the Salamanca has a long tradition in terms of fish and seafood dishes. Today Salamanca is located at the Port Olímpic, where you can watch the hustle and bustle of the harbour. 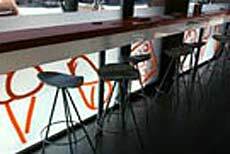 Its location is ideal for enjoying a good meal, day or night. Their seafood can be ordered fresh from the market, the meat is from their own farm and some fish can be selected directly by the guest. "La Fonda del Port Olímpic" is one of the most popular restaurants at the former Olympic Port. You can choose whether you prefer to eat in the restaurant or on the spacious terrace. In the middle of the most beautiful street in the district, the Rambla de Poblenou, not far from the beach is the Belgious Poblenou. Here you can get Belgian waffles, crepes and ice cream in many traditional and exotic flavours with unusual variations. For the crepes you have a choice: either savory or sweet, as well as vegetarian. There is ice cream here in different flavours - regular yogurt, chocolate, peach, Baileys, coconut and mandarin flavour, as well as unusual flavors like turron (Catalan praline), blood orange, macadamia nut, mojito or tiramisu. You can mix the ingredients in whatever way you like. In the Hitit restaurant you can enjoy authentic Turkish food in a friendly and peaceful atmosphere. You’ll get to travel through the cuisine of the old Byzantine Empire, the Ottoman Empire and all the influences that have shaped Mediterranean cuisine over the centuries. Hitit work with the very best products; you can experience a piece of Turkish culture. 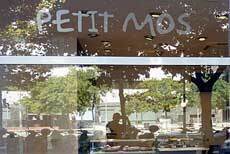 In the Café Petit Mos restaurant you can drink a good cup of coffee or tea, a chocolate or freshly squeezed orange juice. Enjoy the sweet baked goods and a vast selection of filled rolls and snacks with Mediterranean ingredients. You can eat healthily here with typical menus that are fresh and prepared in a Mediterranean style. The place is ideal for relaxing after swimming or physical activity.